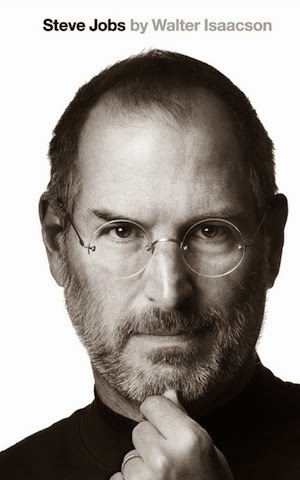 This book is autobiography of Steve Jobs written by Walter Isaacson . Steve Jobs ,the name is enough to identify this highly motivated techie guy. He is god of marketing and has build one of the largest brands "Apple Inc." ,"Pixar" and "NeXT Inc. " . Walter Isaacson is famous autobiographer with who has written for Albert Einstein,Benjamin Franklin and Steve Jobs :) . The book "Steve Jobs" is awesome portrayal of Steve Jobs personality . This book claims to be written without influence or control by Steve Jobs .I specified this point because Steve Jobs was believed to be very sensitive and cautious about his image,brand. The book starts with information regarding his birth,adoption and parents. It is said that his childhood has major role in building his persona. His attitude,style,living is outcome of his childhood. What i deduce from his childhood ,he was living in Silicon valley where technology was evolving everyday .Lot of contributing factors like condition of his adoption " that child should be given to only college graduates" added to education etc. This all information beautifully written in the initial chapter of book . Next chapters cover his friendship with Steve Wozniak ,their pranks ,schooling and college . It's fun to read the mischievous side of Steve . The stories of "Homebrew computer club" ,conventions etc. The initial circuit board works of Steve and Woz . It gives a great inspiration to people who want to start their own company. It shows everything starts from small steps and then we take leaps. Then the next chapter covers his college life and issues . Love life/relationship in college and the use of recreational-drugs etc . Steve has admitted the use of recreational drugs ,marijuana LSD in his young days and says it was an important factor in his life . It helped him to stay relaxed and creative .Readers Please don't get inspired for this,it worked for Steve may not work for you . Then next chapter cover his ZEN theological beliefs ,visit to India and inspiration from Buddhism. He loved India and says his visit to India has had great effect on his life and ideology. He ate very less,vegan diets, simplistic life,ideals and life practices. Next chapter cove his life ,business and innovations. His acquisitions and sell outs,marketing plans . His marketing and innovation strategies. His enthusiasm to make best products ,simple yet elegant. Author has covered phase by phase innovation of Apple 1,Apple 2,NeXT, Pixar ,iPod,iPhone and iPad . How and why they were built .The teams involved . The bouts and shouts . I don't want to summarize the book ,go grab one and read .This was just to make you intrigued. I highly recommend it.The flow of the book is awesome. I loved the book but at some points i did feel that author went partial towards Steve .Even if it so,it's Steve Jobs book it will always be :) . As reader i am very inspired by author,Walter Isaacson ,he has covered great deal of Steve Job's life ,anyone who reads the book will be inspired to be Steve and yes lot of things to learn from him. My recommendation is , Go grab a copy of the book of the book . It's for all techies,students,marketing and sales guys,avid reader and professional. This is not boring autobiography but interesting story of greatest innovator of 20th century.